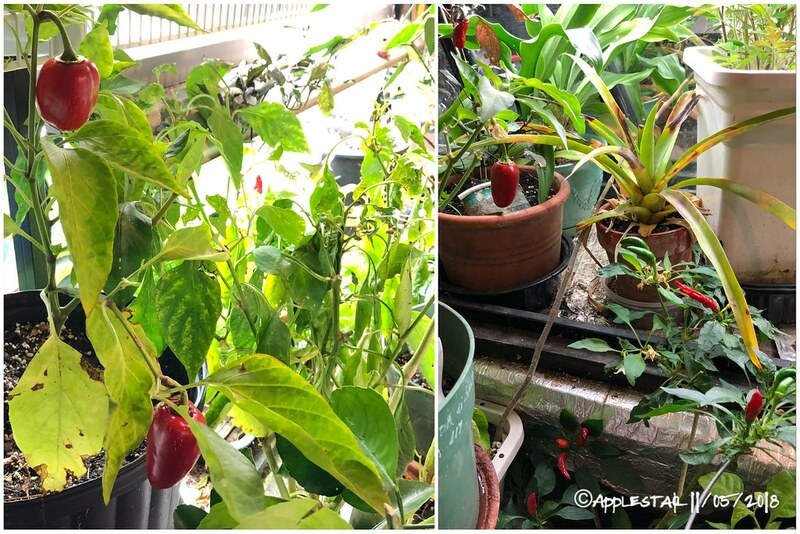 I’ll post this year’s winter indoor garden thread here in the Pepper forum rather than Tomato forum since it’s not looking very good for tomatoes this year, but I brought inside overwhelming number of peppers to overwinter again. Here are some of the lot that had been hurriedly brought into the garage yesterday, ahead of the forecasted overnight frost. Sure enough it had hovered between 33 and 32°F since 2am, and there is a heavy frost on the ground. 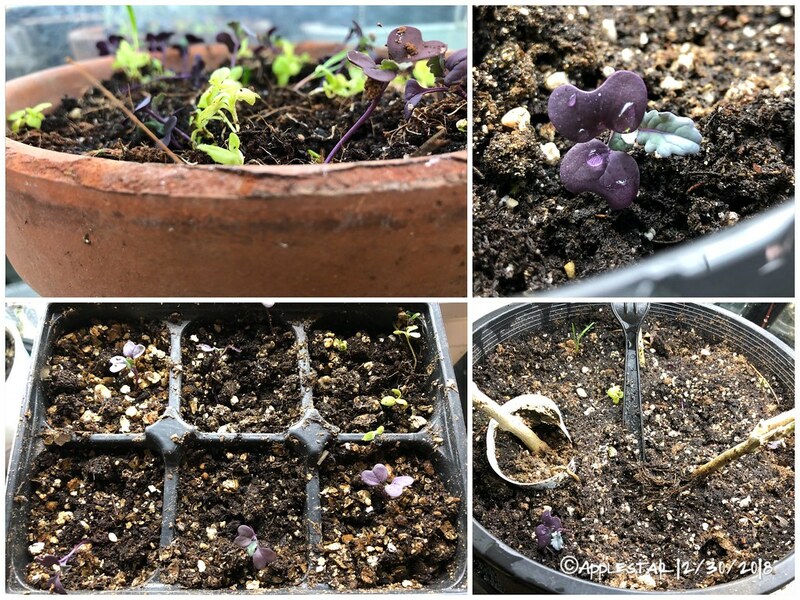 ...I will post about the fate of the ones I left outside to fend for themselves later — I Was hoping to save some by covering them, but the sustained near-freezing temps might have done them in. Subject: Who is growing Turmeric? applestar wrote: I am SO THRILLED!!! Tonight’s forecasted low is 40°F and I was going through my annual, last minute frenzy to bring cold sensitive container plants inside or move them at least to the somewhat more moderate brick patio from their various summer vacation spots. I had left the turmeric until the last possible minute as the sun went down, because the roots had cracked the pot — in Three as it turned out. After NOT finding a suitable pot to transplant them in, I gave up and just plopped the very solid broken pot-shaped rootball/mass in an available plastic pot to bring inside the house, and when I put it down by the porch light, I realized — it HAD BLOOMED! 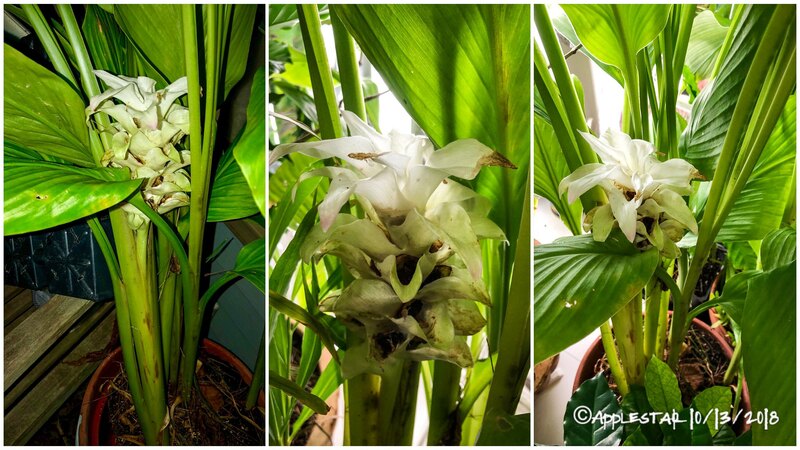 Here, imafan has been posting that HER turmeric are blooming, and I was wishing mine would bloom ...someday... and, unbeknownst to me, it had quietly bloomed and the flowers are already past their prime. — so striking yet dainty - pure white with blushes of pink and magenta and maroon throats. 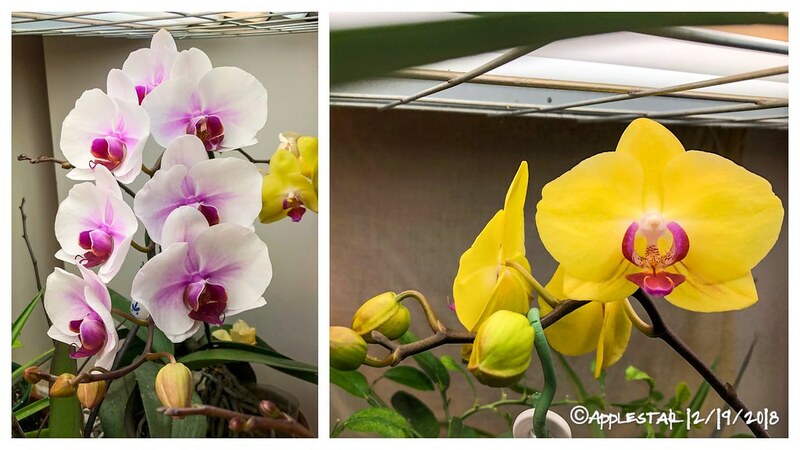 ...and here are the pineapples and orchids, more coffee, etc. under the premium Winter Wonderland lights. The BIG pineapple is the offset that grew from the plant that fruited. After just one short season of growth, it’s almost as big as the plant that fruited had been. Maybe it will fruit next year? 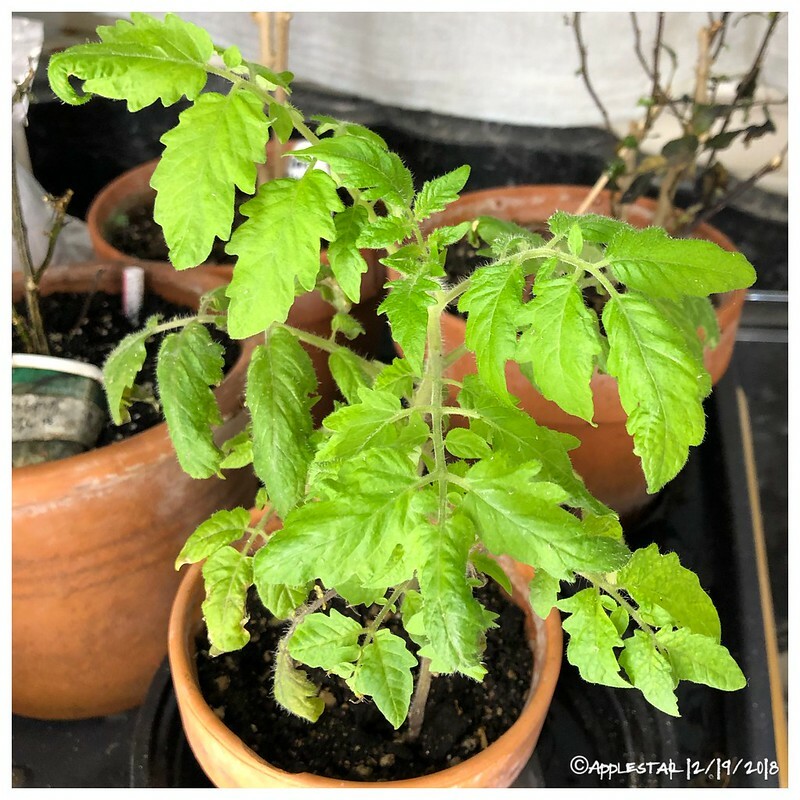 I’m going to keep it warm and well lit over the winter, along with seedling Key Lime which I found out prefers warmer winter temperatures than other citruses. 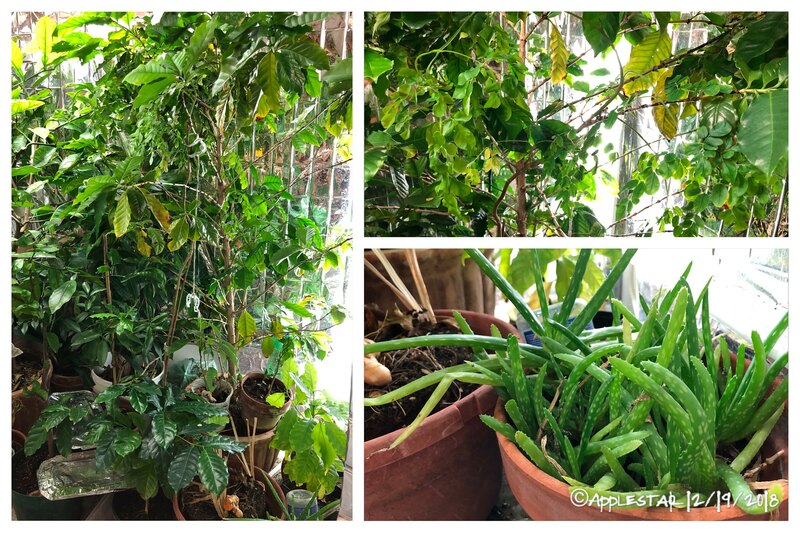 As usual, I have started to Morning Mist these plants that have been moved from outside to inside for the cold months. Right now, the indoor humidity is not too bad — 50’s% — since we have not needed the A/C or the heat very much and they have only operated sporadically during the day and night, if at all. But I feel they are accustomed to their morning dew, so I mist them heavily until dripping wet. As it gets colder, the central forced air heat will be on more often and then continuously, and, over the course of winter, the RH will decrease no matter what I do, until by early March when it finally starts to thaw, indoor humidity will be at worst levels — as Low as 20’s. 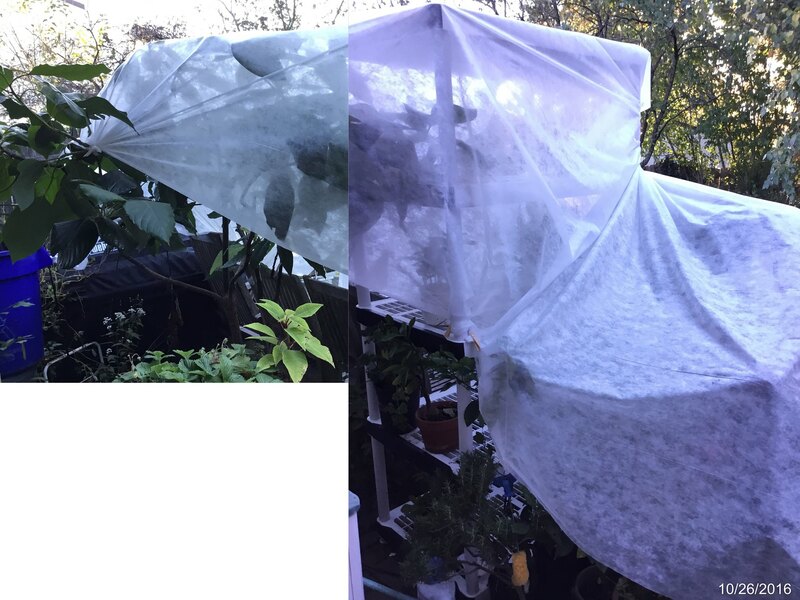 And the plants will manage to acclimate to this and will not suffer too much while they are mostly dormant, but drier air will promote the more resilient pest mite infestation while inhibiting the beneficial predatory mites. 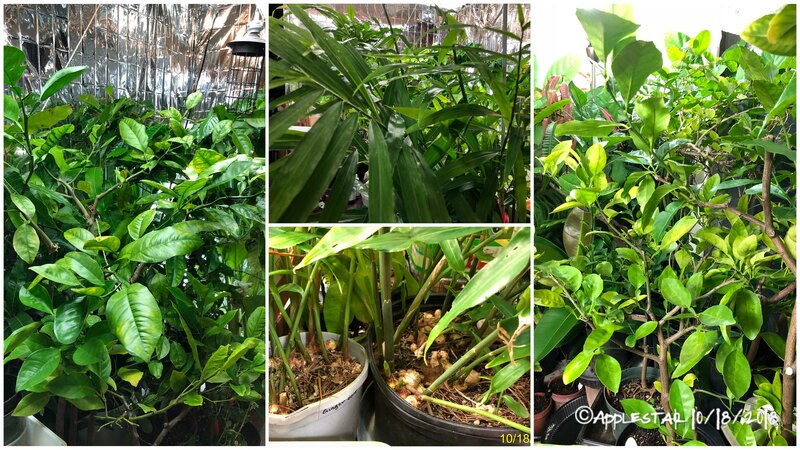 As I mentioned earlier (or elsewhere), I bring my container plants inside after a good windy rainstorm, but I don’t take any steps to spray them down or treat with insecticide. This means some pests stow-away ...as well as beneficials — (I had a grey treefrog that spent most of the winter among my plants one year). So far, I’ve found and dispatched 4 large slugs. I came across this one a while back. Sorry it’s a little hard to see since I had just misted all the plants when I noticed it. I wasn’t sure what this 1/2 inch insect was, but it reminded me of the Praying Mantisfly without the praying mantis-like forearms and eyes... and no wings, so I left it alone... and I saw it once more last week and again yesterday. ...so I decided to do a casual search... and so far, my impression is that it really looks like a Green Lacewing, except this one doesn’t have any wings. So far no corresponding image has turned up and no mention of greenlacewings losing their wings. - The citruses need some shaping at this time. I try to avoid cutting long branches by weighing them down when I can. Their vicious thorns are also being trimmed As time permits. Some of them have long 2 inch thorns, and some of them have numerous tiny 1/2ninch thorns. ... I’m pretty casual about this process and use anything useful/handy that I have available. - The one with toy coffee pot lid hanging from a branch is my tea bush (Camelia sinensis var sinensis). 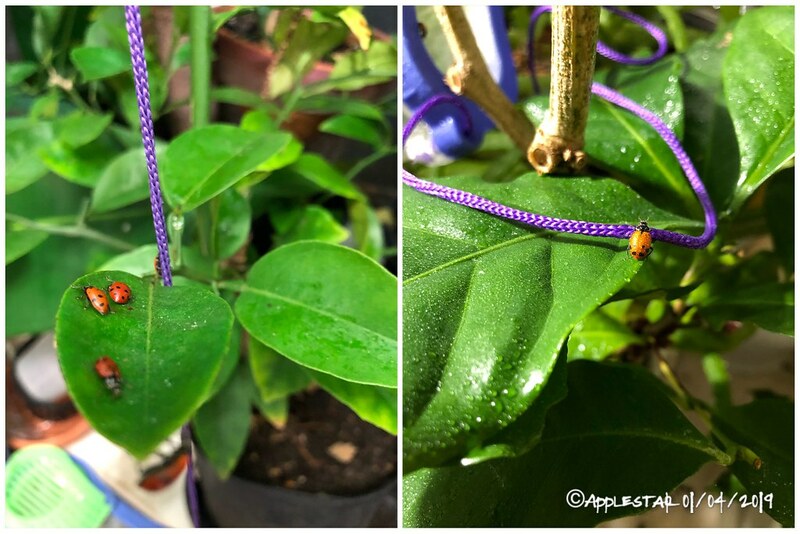 - Most overwintering peppers don’t need shaping and training until later, but I’m using drinking straws as branch spreaders and hanging a pair of scissors to create a downward sweep on this Black Scorpion Tongue Ladybug pepper. I am trying Tabasco, Green pepper and an unknown pepper to overwinter, I'm trying with no lights , only light is from the window. I don't expect them to make it but we will see, If they make it I'm going to try grafting a few to the Tabasco root stock. 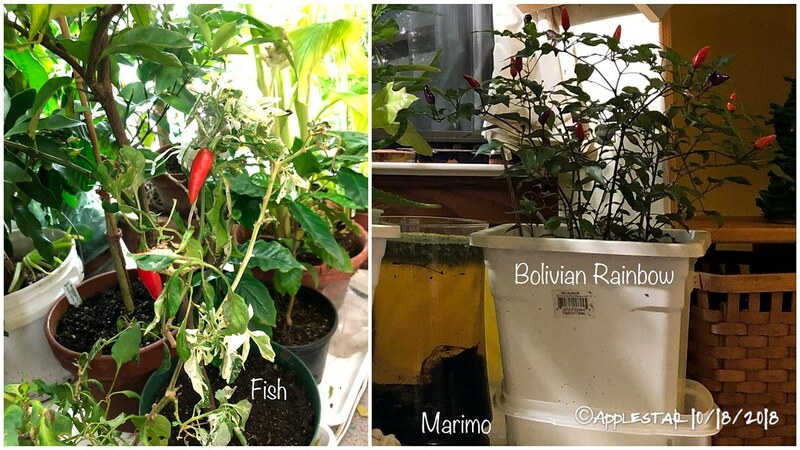 Applestar; were your peppers, for indoor wintering, raised in containers? Have you successfully lifted & 'containerised' any for moving inside? And can they survive till spring with fairly low light levels? Reading your interesting posts its never clear to me how much artificial light you provide for the different plants you keep going. Peppers are easy to lift and pot up, they will survive even if they are not strictly potted up. 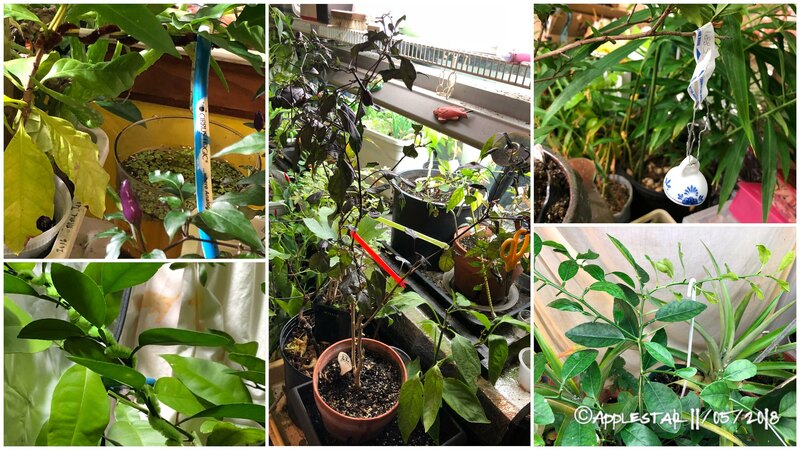 I go to extremes, so only the favored ones are carefully potted and put in good light if I want them to continue to fruit during fall/winter, or, during the spring flush of new growth, so they would grow good sturdy branch structure for the coming season. To dig up the pepper plants, I use the garden fork and go all the way around, deep. Then using my bare hands/fingers I explore the loosened soil around the plant for thick feeder roots that radiate out. I use steady pull to get as much of those feeder roots as I can without breaking them. The rest of the pepper rootball is usually very small. Once I save the feeder roots, I find it’s OK to just dig up/lift with garden shovel and slide the rootball on top of coiled feeder roots in doubled or tripled plastic grocery/shopping bags. If I lost too much soil around the roots, I toss in some more garden soi, or add potting mix on top later. They can stay in the grocery bags until ready to be potted up....or not. Less “loved” ones have spent the entire winter in their grocery bags — just be sure to use newer bags that will not get brittle and fall apart before spring. 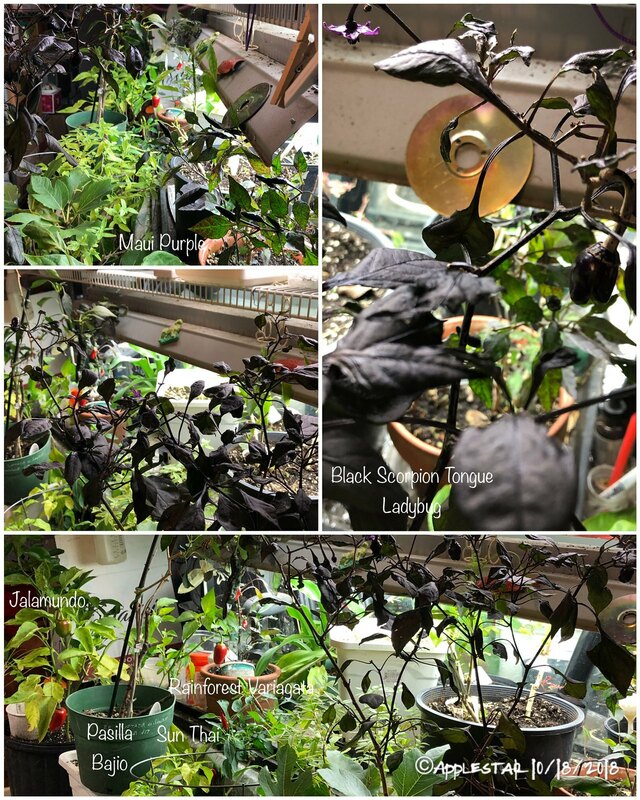 - Leafless dormant or pruned-to-sticks peppers in cold temperatures in the 30’s to 40’s don’t need much light at all — north window, even. 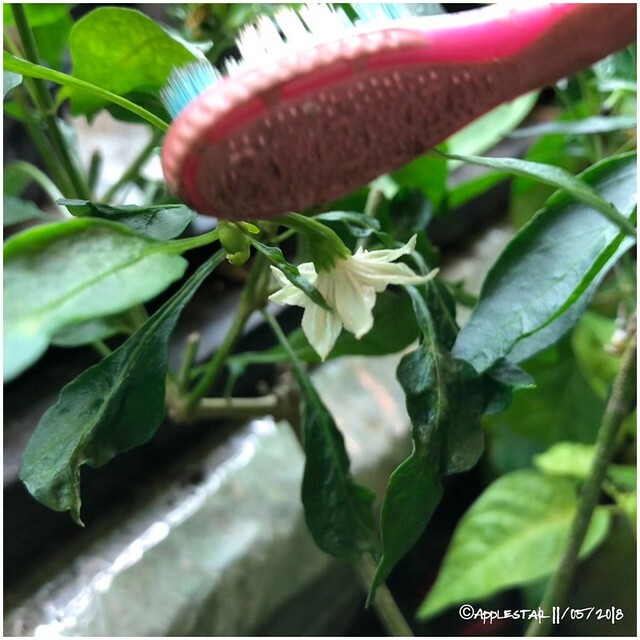 - non-blooming, non-fruiting peppers will “rest” if kept in low temperatures like 40’s to 50’s and will not need bright light. Give them less water and let them slowly yellow, dry, and drop leaves. East or west window might be sufficient. - peppers with green fruits that you want to mature should be getting south window light and kept warm-ish 50’s to 60’s. - peppers that you want to encourage blooming and fruit setting should be in 60’s to 70’s with maximum light. South window with moderate supplemental light — I leave the light on from sun up until my bedtime ...so approximately 15-16 hrs. Or under shoplight but they can go on the ends of the fluorescent tubes since they don’t need as much light as tomatoes — THEY get the premium brightest spots in the center zone of the tubes. applestar wrote: Yesterday -- mad rush to bring in these peppers. They look wilted, but no wonder since they lost most of their roots. They perked up after being potted up, or even in their bags after being watered and put in shade. -- the trick with digging up peppers, I found, is to NOT use a shovel which will cut off the long feeder roots, sometimes too close. They seem to have a tight cluster of shorter fragile roots and extra long feeder roots radiating in all directions. I use garden fork to loosen up the soil all around the plant, as much as 2 feet out (4 foot diameter), then lift up the foundation rootball, then use my bare hands to explore and find the feeder roots -- they are wiry and strong but will break if bent. I steady pull to recover as much as I can from the loosened surrounding soil. Put the nearly bare-root, root ball in doubled plastic grocery bag, then pile some of the soil on top of the roots to keep from drying out. I’m determined to put more effort in caring for my container tea shrub. Up until now, I have been somewhat cavalier, and have taken only minimum care not to let it die. To inspire myself, when I brought it inside before frost along with other non USDA Zone 6 hardy plants, I Uppotted it into a fancy glazed pot I got from my Mom. It’s currently sitting on a spare bed-side stand in the green room, but the room needs to be organized better. But while it’s at a convenient well-lit height, I decided to prune and train it for better branch structure for next year. I’m going to keep pruning and shaping it into what I will consider a “pleasing shape” and at the same time, harvest the tea leaves. Fall-harvested mature leaves are called Ban Cha and branch-tip twigs are called Kuki Cha. Usually harvested around early October, before the shrubs are pruned for the winter to shape and prepare it for mechanical first harvest in spring. After lightly steaming and roasting, and tearing up the big leaves and rolling the pieces, I have about 1/2 cup of somewhat packed tea leaves and tip twigs which when dried will maybe yield enough for two pots (I use enough leaves to obtain about 4 servings per tea pot). Looking good, Now I'm green with envy! ...than the one in the Green Room which is on a low cabinet (an old TV stand=sofa side table height). The leaves on the one inside are starting to curl and there are signs of mites. Decreasing humidity is not helping. I will probably move the one in the Green Room to the floor level in search of coolest in-house micro-climate, or to the Garage so it will not suffer and decline as much during the rest of the winter. I don’t expect to be able to put them back outside until late March. ...In my experience, these borderline to “just missed” USDA Zone winter hardiness plants are more difficult to overwinter in the house. 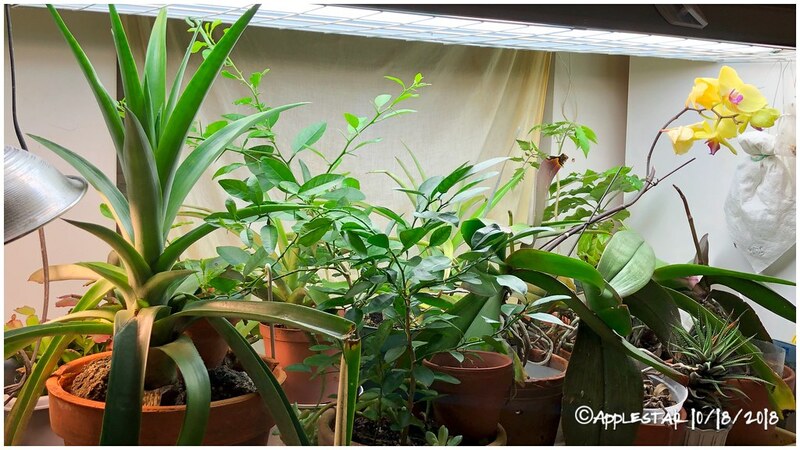 The winter indoor temperatures in rooms that are comfortable for humans are suited to tropicals (in the upstairs warmer 60’s rooms), sub-tropicals (downstairs 50’s to low 60’s), and are barely comfortable for plants that are hardy up to 2 zones warmer — which would be Zone 8/9 for me in borderline Zone 6b/7 . 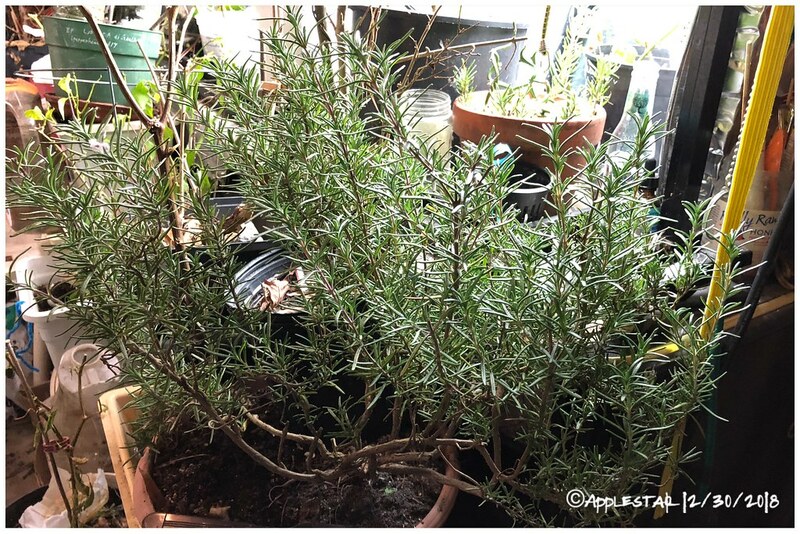 Zone 7/8 hardy plants like rosemary suffer in the heated house that is comfortable for humans, but couldn’t survive the outdoors without protective measures that sometimes can fail without diligent monitoring (and in MY case, I won’t go outside often enough during the winter to make sure). If kept in the coldest floor-level micro-climate of the house, they can manage for the most part as long as their other needs are met to minimize stress. 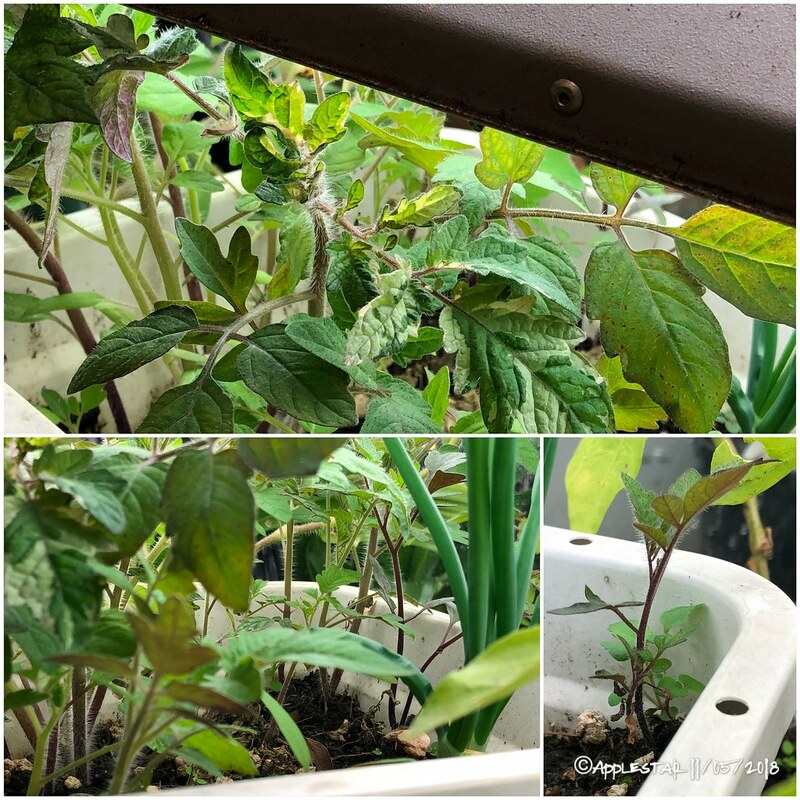 - bottom right - I transplanted some of the seedlings in this pot containing 3 “overwintering” pepper plants that may or may not survive in the unheated garage. The greens can take over if they can, and I added some fertilizer so they will have something to grow on. 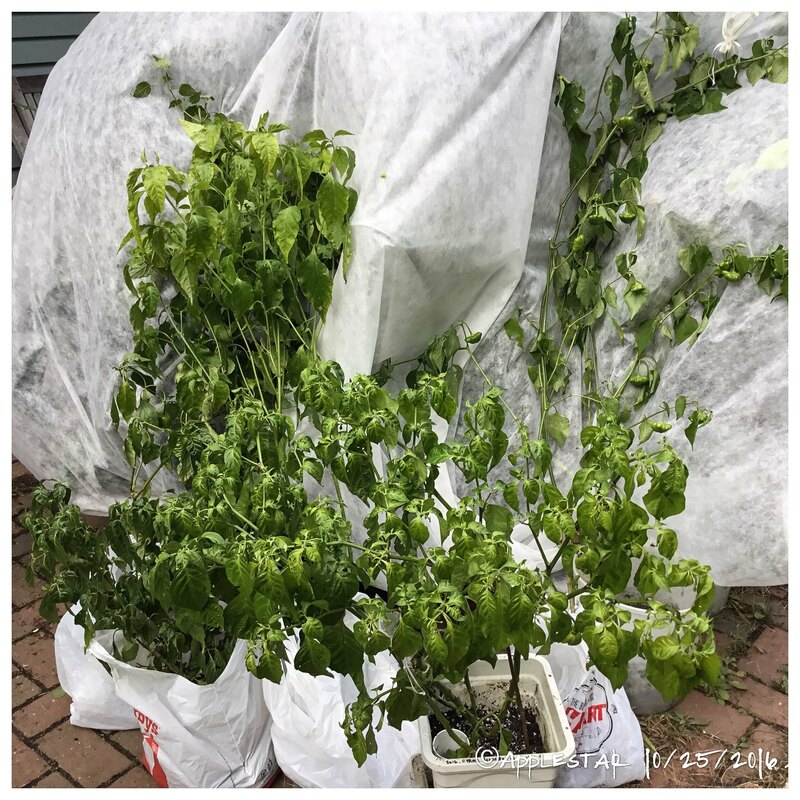 ...IF I’m serious about wanting to save any of the pepper plants in the garage and to really overwinter them, THIS is the time of the year when I need to start bringing them inside. I actually should have started right after Winter Solstice, but we havent had the super cold lows we normally get after Christmas.... yet. Last year, I bought a package of ladybugs early and started releasing them in the indoor garden in the fall, but I missed the opportunity this year when we had an unseasonable drop in temperature. Then I didn’t get the opportunity to order them until about a week ago. 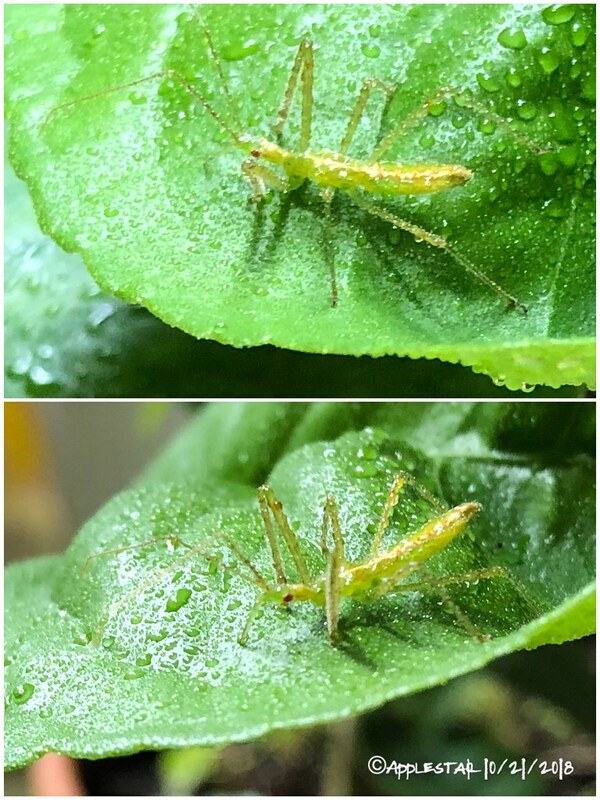 In the mean time, my overwintering peppers have been suffering from aphid infestations and citrus has (still minor) scale insects making an appearance. I’m seeing ants, too. “Chicken-or-egg” situation, but personally, I believe it’s the ants that bring the pests. We have had some flooding rain, as well as unseasonably warm temperatures — even up to 50’s and 60’s, which would have caused some of the Ant scouts to venture into the house. So I released the first squadron after misting all of the plants. The ladybugs that looked “dead” in the net bag when I first looked at them in the cold garage rapidly came back to life as soon as I brought the small portion to be released in a lidded container into the house, and they warmed up. The remaining ladybugs were lightly misted from outside the bag and then put in a padded envelope with airholes snipped from the corners and sides, then placed in an open cardboard box in a somewhat dim location of the garage. They should just continue to hibernate in the above freezing garage, and I can release some more as deemed needed. If we get the “dead of winter” low temps that plunge the garage down to sub-freezing temperatures, I will put them in DH’s bait fridge in the garage so they will continue to be chilled but not freeze. 2018 - what peppers are you growing?